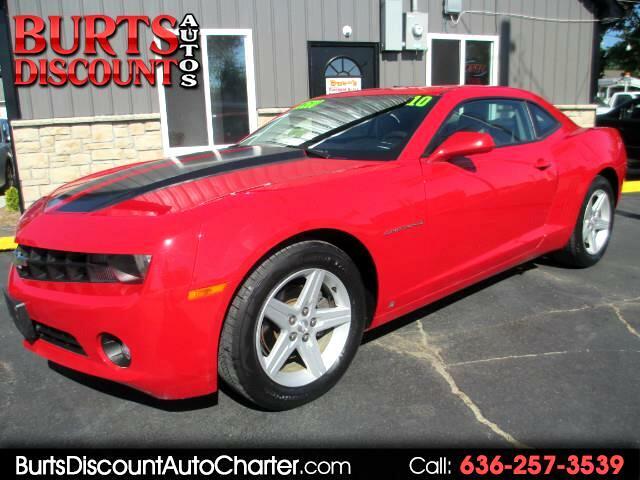 THIS 2010 CHEVROLET CAMARO LT COUPE IS AVAILABLE ON THE LOT HERE AT BURT'S DISCOUNT AUTOS. A 3.6 L, V6 ENGINE POWERS THIS FINE LOOKING CAMARO WITH AN AUTOMATIC 6-SPEED TRANSMISSION AND RWD. ALL STANDARD OPTIONS ARE IN WORKING ORDER...ALLOY WHEELS...WARM TOASTY HEAT/DEFROST...NICE RIDE. WE ARE SELLING THIS CLEAN TITLE VEHICLE ON CONSIGNMENT ALMOST $2000 DOLLARS BELOW RETAIL AVERAGE. IT IS SALE PRICED AT $10,700 AND HAS 75K MILES. THIS IS 20K MILES BELOW THE CFS AVERAGE. WE WOULD LOVE TO SPEAK WITH YOU REGARDING THIS OR ANY OF THE QUALITY AND AFFORDABLE VEHICLES ON THE LOT HERE AT BURT'S DISCOUNT AUTOS.